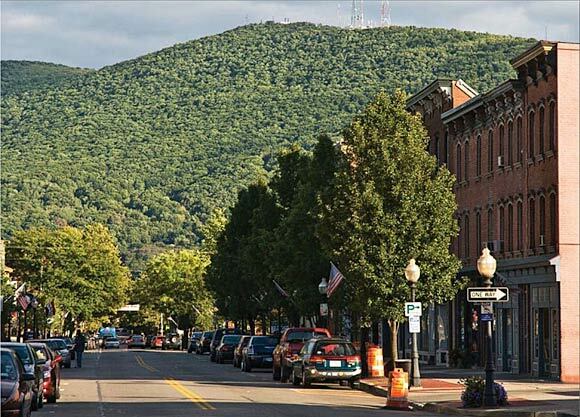 Beacon's revitalized Main Street with Mount Beacon in the background. Photo © Greg Miller Scenic Hudson has a unique investment in the green infrastructure and economic foundation of the City of Beacon. This depressed, post-industrial city in southern Dutchess County on the Hudson River was riddled with crime and drugs on its Main Street, underinvestment in housing stock and the loss of its industrial and jobs base. Waterfront factories and an active industrial rail yard had long been shuttered. Scenic Hudson recognized in Beacon a unique combination of location, scenic beauty and strong local elected leadership and began investing collaboratively in the city over a decade ago. We purchased more than 2,000 acres of Hudson Highlands land, located in the city and nearby East Fishkill, and created a trailhead within the city limits to enable people to enjoy recreational and tourist activities in this wilderness -- especially to admire outstanding views encompassing the Hudson River, the Catskill Mountains and even the Manhattan skyline. In the 1990s Scenic Hudson protected 234 acres on the slope and crest of historic Mount Beacon and created Mount Beacon Park. The land had been the site of an incline railroad in the early part of the 20th century; we created a stairway along the route of the railroad and interpretive signs explaining this popular tourist destination. Scenic Hudson also worked with the city to create Madam Brett Park along Fishkill Creek, an important Hudson River tributary. People enjoying Peter Jay Sharp Park Scenic Hudson went on to purchase several contaminated waterfront parcels, collectively known as Long Dock Beacon, to do initial remediation of contamination and lay the groundwork for their redevelopment. Construction currently is being completed on an $8.5-million project to turn 16 acres of this former industrial site into Scenic Hudson's Long Dock Park. Exciting new amenities include a kayak pavilion, restored wetlands and a renovated historic barn -- the home of Scenic Hudson's River Center for arts and environmental programs. The park also provides an "outdoor classroom" for city schools and connects people to stunning Hudson River and Highlands vistas. 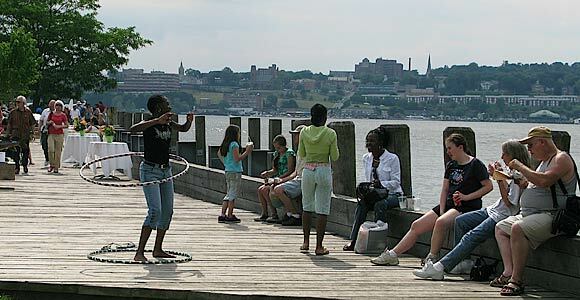 Scenic Hudson's Peter Jay Sharp Park, located at Long Dock's tip, features Beacon Point, a shoreline installation by renowned artist George Trakas. Designed as a series of gradually cascading steps recalling undulating waves, the work projects out over the river (at high tide water actually flows through it), making this a perfect place to fish, sunbathe and admire the magnificent views. While the current downturn in the real estate economy has sidelined a developer's plans to build a green hotel/conference center on the Long Dock property, the new park leaves room for sustainable commercial development to be pursued in the future. Dia:BeaconPhoto: ©Richard Barnes. Courtesy Dia Art Foundation. Because of its active leadership role in Beacon's redevelopment, Scenic Hudson was asked by community leaders to serve as convener of local, county, state and federal officials to attract an international art institute to the city. We brought key players together and helped assemble a package of incentives for Dia Center for the Arts to make a more than $25-million investment in the adaptive reuse of an abandoned Nabisco box factory on the Beacon waterfront. 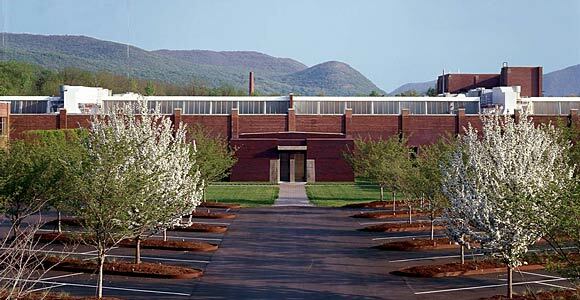 Today Dia:Beacon attracts visitors from around the world. Scenic Hudson also worked with the city to secure permits for a ferry dock where Metro-North has established a commuter ferry link with the city of Newburgh, immediately across the river, whose waterfront is being revitalized with restaurants and shops. (Scenic Hudson purchased land just outside Newburgh to help begin a similar process in that city.) And as a project evolves to build a transit-oriented development around the Beacon train station, we're working with Metro-North and the Metropolitan Transportation Authority to ensure that environmental, traffic and other citizen concerns are addressed.